When do People Need Braces? One of the treatments can be done to straighten teeth is to use braces. But, when someone really needs braces? The use of braces is usually quite simple without using needles, anesthesia or drilling teeth. Braces can be used at any age, but the ideal age to use the braces is the age of 10-14 years. Before using braces doctor will perform an audit to determine how much space is available for braces, tooth location that needs to be clarified and to see the condition of dental health such as whether or not there are cavities . 1. To straighten teeth. The form that crooked teeth or misaligned can cause problems in terms of the bite, chew and process the food. These conditions have likely cause headaches and pain when biting To correct the condition. For example, if the position of the upper jaw teeth are too far forward or the lower teeth are too far to the inside, so having an improper bite position. This condition will cause tension in the jaw and make someone bite incorrectly. In addition, in certain circumstances can cause bone damage. 2. To be able to chew food better. If the gear position is not correct, then the food intake will not be chewed properly which eventually can lead to disturbances in the stomach. 3. The presence of respiratory problems. If there is a change in tooth structure then can trigger changes in the mouth. If teeth are not straight and aligned, it will cause respiratory distress. 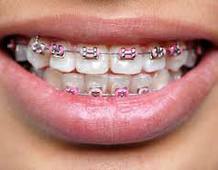 In addition there are also people who use braces for cosmetic reasons, but do not really need it. The reason is usually for someone to have a beautiful smile and perfect teeth shape.